A decorated Khatmband ceiling in Srinagar, Kashmir. Kashmiri cultural life exhibits a unique intermingling of traditions from the age of Buddha to the Mughal dynasty. In an age where nothing ever remained the same, the Mughals came to the valley and started spreading their religion, culture and trade. This included their art and craft, which consisted of paper mache, new types of wood carving, chain stitching and food. After the Mughal rule came to an end in 1753 AD, the Kashmiris capitalized on Mughal art and craft, making it a part of their culture. The craft passed down one generation to the other in the valley.While some Kashmiri handicrafts are still practiced in great numbers, a few such as Khatamband (a ceiling made of wood work in a geometric pattern) and Panjrakari (a framework consisting of a crisscrossed pattern of strips of building material) are executed less nowadays. Panjrakari work on a window. Khatamband and Panjrakari works were seen in the old towns of Srinagar city including the Habba Kadal, Saraf Kadal and Zaina Kadal areas. Numerous houses were decorated with lattice works and crafted ceilings. These crafts were also carried out in other parts of town such as Charari Sharef, Islamabad, Sopore. 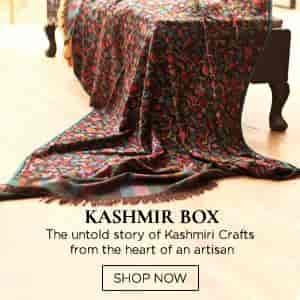 “However, Safa Kadal was considered to be the hub of this craft as almost every craft man belonged to that area of the Srinagar city,” said Zareef. Some famous craftsmen of this work include Subhan Basmati, Ramzan and Amee. These craftsmen spend their life promoting the craft and passed on their knowledge to many Kashmiris. On the steady decline of the crafts, in the past there were hundreds of designs of Khatamband and Panjrakari, but today only 10-30 designs are found. “As vast the craft was, no one knows it fully today,” said Maqbool, a craftsman. Every individual tries to show his own creativity in this field. The art of Khatamband and Panjrakari almost perished during the nineties when no one was able to afford the huge amount of luxury on such things. “We (craftsmen) were going through a tough period during those days,” said Maqbool, adding, “Until 2005 we were in bad condition but after that people started showing interest in the craft once again.” Nowadays, people decorate the ceilings of their halls and balcony windows with this craft. The trend is of the old fashion and the demand for culture has returned.